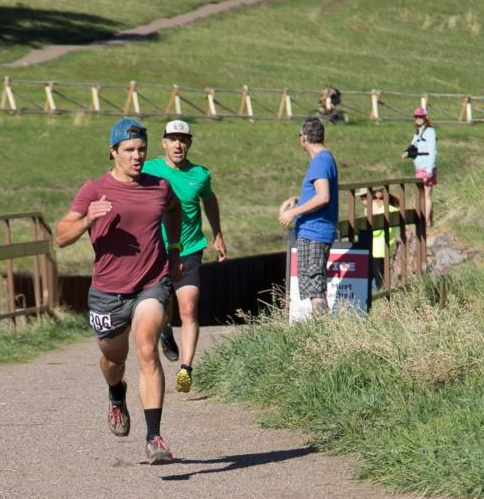 Kevin Correale and Matt Buzas battled neck-and-neck in the final stretch of the Elk Meadow 10K Trail Race on Saturday, with Correale edging Buzas by one heartbreaking second as he crossed the finish line in 49 minutes and 13 seconds. Buzas' time was 49:14. Amanda Sullivan, the first woman, finished third, covering the challenging course in 50:19. The race was one of two races put on by Evergreen Park & Recreation District (EPRD) on Saturday, June 3, to kick off the 2017 Evergreen Trail Racing Series. In the 5K, Brandy Erholtz ran away from the field to finish more than six minutes before her closest competitor in 21 minutes and 39 seconds. Drew Bolin was the second finisher and first male, running 28:06. About 80 people ran the two races. The Elk Meadow events were the first of five races on mountainous terrain in and around Evergreen. Distances range from a 5K to an epic half-marathon (13.1 miles) to the top of Bergen Peak. For more information or to register for other races, visit bit.ly/TrailRaces.